Whether you are a professional or recreational diver its always important to have equipment that you know you can rely on. Besides your scuba gear, perhaps one of the most important pieces of tech is your diving watch. Being able to accurately time your dives is crucial and the TAG Heuer company has designed a line of Aquaracer diving watches that ensures your diving safety comes first without excluding a sense of style. As its name implies, the Men’s Aquaracer WAJ1110.BA0870 is completely water tight and resistant up to 500M (that’s over 1600 feet!) and is Swiss Quartz powered, guaranteed to continue working with precision timing while you swim or dive. Its casing is tightly protected by a scratch resistant sapphire crystal in the front and a screwed down crown and case in the back. A black, vertically lined Guilloche for style and the TAG Heuer brand name displayed for identification. Silver bar markers for hour hand, minute hand and time indexes. A second hand with orange extremities to stand out for time keeping during sports events. A magnified date window at the nine o’clock position. Black rubber molded over the stainless steel bezel and silver minute markings overlaying that. Luminescent dial markings for high visibility. Unidirectional Rotating for the steel-rubber bezel. Automatic Helium Escape valve at the ten o’clock position to regulate pressure during dive. Sapphire-Crystal material and authentic TAG Heuer brand logo etched into the crown. 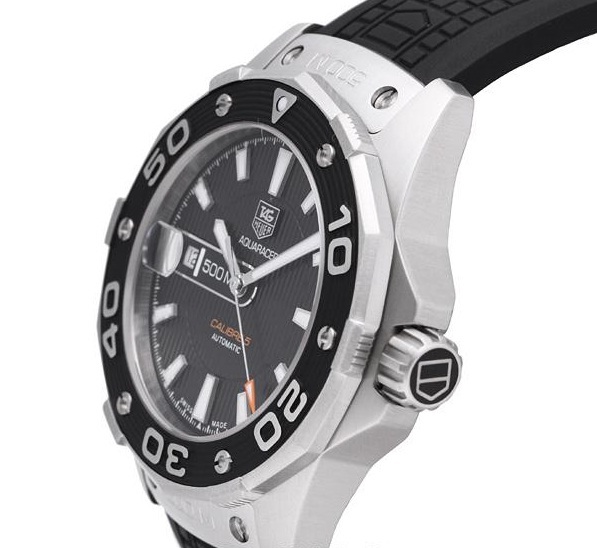 TAG Heuer is known for manufacturing high end diving watches for the serious aquanaut. This Aquaracer WAJ1110.BA0870 comes equipped with luminescent dial markings and hands that will shine clearly through water and muck when submerged. One of the better features of this watch is that it includes a unidirectional rotating bezel, clearly marked and easily set to keep track of your extended diving periods. The bezel timer is constructed to only rotate counter-clockwise ensuring that if it gets bumped during a dive, your tracked diving time will only shorten, not lengthen, protecting you from accidently staying under too long. The side view reveals the TAG Heuer etched crown as proof of authenticity. The Aquaracer comes in variations of blue and silver dials with steel or rubber bracelets available. Being designed for diving this watch was made for maximum visibility and durability, but because so it is heftier and more sizable than your average timepiece. The watch case alone is 43 mm in width, 13.4 mm in thickness and a max wrist size of 8 inches, making this a large and heavy timepiece compared to its competitors. TAG Heuer luxury timepieces are all crafted for style and precision and all for an affordable price. This watch is listed at $1,950 but is available at discount from numerous retailers, prices ranging from $1,500 – $1,700. 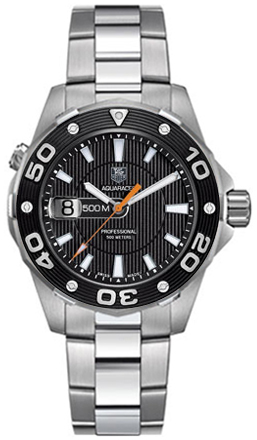 The Aquaracer is one of the more stylized collections of diving watches for men. If you’re looking for a fetching watch that can hold its own in extreme conditions, consider the Aquaracer line as a viable option.